We’d love your help. Let us know what’s wrong with this preview of Blackout by Meredith McCardle. Seventeen-year-old Amanda Obermann (code name: Iris) has more on her mind than usual. As a member of a covert government organization called the Annum Guard, which travels through time to keep history on track, Iris has been getting some particularly stressful assignments. Plus, Jane Bonner, the Guard’s iron-fisted new leader, seems determined to make life as hard as possi Seventeen-year-old Amanda Obermann (code name: Iris) has more on her mind than usual. As a member of a covert government organization called the Annum Guard, which travels through time to keep history on track, Iris has been getting some particularly stressful assignments. Plus, Jane Bonner, the Guard’s iron-fisted new leader, seems determined to make life as hard as possible. Thankfully, Iris has Abe (code name: Blue), her boyfriend and fellow Guardian, who listens to her vent—and helps her cope with her mentally ill mother’s increasingly erratic behavior. I've said this countless times but I really do hate cliffhangers! WHY DO AUTHORS ALWAYS DO THIS TO ME? I refuse to accept cliffhangers anymore! Also, this sequel was better than I expected as well! I'm so happy I haven't hit the terrible two's lately or read super bad books this week alone. Overall, I really loved this book. It gives you a whole bunch of stuff, like: deception, corruption, time travelling, betrayals, truths and like I said A WHOLE BUNCH OF STUFF. Amanda/Iris is still a member of t I've said this countless times but I really do hate cliffhangers! WHY DO AUTHORS ALWAYS DO THIS TO ME? Amanda/Iris is still a member of the Annum Guard and when she thought everything was going to change for the better - it didn't. Nope, because there's a new thorn in her paw (metaphorically speaking!) and that thorns name is: Jane Bonner. I was kind of hesitant on how their relationship would be because I didn't want anything bad to happen to Amanda/Iris because there was someone new in charge that was making things difficult. Then there are the amazing missions that kept me on the edge of my seat the entire time. I couldn't look away from the pages. I was just so freaking invested that I wanted more and I didn't really want the chapter or the book to end, ever. Trust me, it was so freaking good! I couldn't put the book down! I was just devouring it so quickly that I really had to physically step away from this book. I hate going through books so quickly now because I'm basically already done with my reading challenge for the YEAR. I just haven't typed up all of the reviews that I've read so far. Trust me, there's a whole bunch of reviews I need to type but life gets in the way. SO even though I read very quickly and work is always getting in the way, I will probably write my reviews more slowly?!? Maybe?!? I don't know! AWESOME sequel, but I have to admit I enjoyed book one a lot more then this one!! But it still lived up to my expectations!! And HOLY HELL, can we talk about cliffhangers??? This one was FREAKING TORTUREEEEEEEEEEEE!!!! THAT'S ME IN DESPERATE NEED OF BOOK THREE AFTER THAT TORTURO AWESOME sequel, but I have to admit I enjoyed book one a lot more then this one!! But it still lived up to my expectations!! And HOLY HELL, can we talk about cliffhangers??? This one was FREAKING TORTUREEEEEEEEEEEE!!!! A thrilling, twisted plot, with deception and corruption fueling the vengeance through time and back, with determined heroines ready to fight to the end for the truth, with betrayals and shocking revelations that will shake this world to the very core... BLACKOUT is a sequel not to be missed!! BLACKOUT was a much anticipated sequel for me after the ending of THE EIGHTH GUARDIAN! I LOVED book one and was ecstatic to get back into this complicated world. I really enjoyed BLACKOUT, and was so SHOCKED at the way it ended. Man, that cliffhanger almost killed me!! It was absolute torture not knowing what will happen next. If it's one thing that Meredith McCardle knows how to write, it's thrilling, heart-pounding anticipation to keep you reading or wanting to read more!! Well done McCardle!! One issue that I did have with BLACKOUT though, was the slow pacing. Sometimes I can look past it, and lately with some books I even enjoyed the slower pace and thicker world development. But in BLACKOUT, that was not the case. It felt like it was almost halfway through until something really stated happening. And after LOVING THE EIGHTH GUARDIAN, I had really high expectations of BLACKOUT, maybe even to a little to high. BUT... BLACKOUT still turned out to be pretty awesome nevertheless. I REALLY enjoy this world setting, and traveling back in time, and the characters were awesome. But my feelings for the love interest Abe, still has not increased much. But it really wasn't a big issue for me at all. But Iris was a great heroine: Strong, determined, smart, skillful, and prepared to go to any lengths to save her friends and the people in danger of the corruption. Overall, BLACKOUT turned out to be a pretty good sequel, though I did enjoy it's predecessor more, but by the end I was hooked and totally shocked with the ending!! I think anyone who enjoys time travel with action and adventure, mystery and corruption, thrills and strong heroine's will definitely enjoy this trip back in time to uncover America's hidden secrets...;) I will be eagerly anticipating book three, and if it's anything like the first two books I'm sure I'll definitely enjoy it!! NOTE: I received an ARC from Skyscape/Amazon for reviewing purposes! All opinions express are my own and are not influenced in any way! Blackout by Meredith McCardle is the second book in the Annum Guard series and I have been waiting (a bit impatiently) for this book to come out. Not only because I love time-travel books but because the mystery of what is going to happen next with these characters always keeps me turning the pages. Keep in mind that if you haven’t read book one, this review might mention some things that you might not want to know yet. Amanda Obermann is Iris and she still a member of the Ahhh....that ending!!! Amanda Obermann is Iris and she still a member of the Annum Guard, a covert government organization that keeps history on track, and things are necessarily going as she had hoped they would once Alpha was killed. Now Jane Bonner is the interim leader and she is definitely making things difficult – for everyone. It is hard for Amanda to believe Bonner is there to make things better and as Amanda continues to dig into who she is and why she is now in charge, she finds out some interesting things. The one bright spot for Amanda is that Abe now works for the Guard too even though it has created a tense situation with his grandfather. Abe balances Amanda out and while she continues to figure out what is going on with the guard as well as what to do with her mother, she is able to lean on Abe and he provides support, guidance, and at times, a bit of tough love to help Amanda figure things out. As the guard continues to go on missions, things begin to get dangerous due to the fact that the guardians are disappearing and no one knows what really is happening to them. Amanda covertly begins working with Red to figure out what is really going on and what Bonner is up to and finds out some very interesting things about not only those individuals with the Annum Guard now but also those that started the organization. McCardle does a wonderful job of pulling the reader into the time-travel by providing some great descriptions and keeping the story moving. I found myself turning the pages just to find out what was going to happen next - I wanted to know what else Amanda was going to find out. The mysteries really help move the story but I also love that there is a lot of action too and not just a history lesson – and this is from someone who loves history. I thought this was a great second book that helped move the story forward and was happy to see that there was a great mix of action, character development, and story progression. Relationships change along the way and major things happen – I know that is so, so vague but I can’t say what without really giving anything away…so I won’t. Just trust me when I say, if you haven’t started this series, you should get started. I loved everything that McCardle did with this story, even if the end of this book almost killed me (figuratively…obviously). I have no idea what will happen next for Amanda and am excited to see what McCardle does next with this series. Band 1 der Zeitenspringer Saga fand ich schon sehr überzeugend, so wollte ich auch gleich Band 2 Lesen. Besonders da Band 1 sehr interessant geendet hat und mich nicht völlig überzeugen konnte, der letzte Funke hat gefehlt. Das Cover von Band 2 ist seinem Vorgänger sehr ähnlich, nur die Farbe wurde geändert. Es wirkt immer noch edel und erinnert mich nicht gleich an einen Zeitreiseroman. Doch finde ich es sehr stilvoll und die Farbe gefällt mir gut. Die Gestaltung von innen ist auch ansprechend. Band 1 der Zeitenspringer Saga fand ich schon sehr überzeugend, so wollte ich auch gleich Band 2 Lesen. Besonders da Band 1 sehr interessant geendet hat und mich nicht völlig überzeugen konnte, der letzte Funke hat gefehlt. Das Cover von Band 2 ist seinem Vorgänger sehr ähnlich, nur die Farbe wurde geändert. Es wirkt immer noch edel und erinnert mich nicht gleich an einen Zeitreiseroman. Doch finde ich es sehr stilvoll und die Farbe gefällt mir gut. Die Gestaltung von innen ist auch ansprechend. Am Anfang jedes Kapitel findet man eine Blume, die der auf dem Cover ähnelt. Sehr angenehm zu sehen fand ich auch, dass die Seiten nicht so vollgepfropft sind, links und rechts gibt es einen schönen Abstand. Der Schreibstil von Meredith McCardle lies sich wieder ausgesprochen gut lesen. Ich habe das Buch innerhalb von 2 Tagen verschlungen. Sie lässt auch immer mal wieder geschichtliche Zahlen und Ereignisse einfließen, doch sind diese so gut verpackt, dass sie nicht erdrückend wirken. Das Thema Zeitreisen ist ja immer so eine Sache. Oft wird es nur unzureichend erklärt oder es tauchen Logiklücken auf. Beim Lesen des Buches habe ich auf so eine Ungereimtheit gewartet, doch bleib sie aus. Hin und wieder kam mir etwas komisch vor, doch wurde es kurz darauf schlüssig erklärt. Wobei schlüssig hier natürlich im Kontext betrachtet werden muss. Die Charaktere, allen voran Amanda haben mir gut gefallen. Sie hatte wieder meine Sympathie und auch manchmal meine Bewunderung für die Selbstkontrolle. Das auch Private Dinge mit einfließen ( ihre psychisch kranke Mutter) hat ihrem Charakter meiner Meinung nach mehr Tiefe verliehen. Die Liebesgeschichte war wieder schön dezent. Sie war vorhanden, dominierte aber nicht die Handlung. Amanda ist ein starker Charakter, so was mag ich sehr gerne. Sie behält den Überblick und die Kontrolle, weiß was getan werden muss. Ich wollte eigentlich nur kurz in das Buch rein lesen, konnte es dann aber nicht mehr aus der Hand legen und hab die ersten 200 Seiten am Stück gelesen. So fesselnd und spannend fand ich es. Nach Band 1 waren viele Fragen offen, ein paar davon wurden auch geklärt. Doch wurden auch wieder neue aufgeworfen, sodass es spannend bleibt. Das Ende ist wirklich böse und ich würde am Liebsten gleich zu Band 3 greifen. Weil ich unbedingt wissen möchte, wie es weiter geht. 4/19/15 Kindle Daily Deal $1.99. On sale on Audible for $5.24. 3.5 stars. The sequel to The Eighth Guardian is fast paced and kept me quickly turning pages from start to finish. I wanted to figure out what was going on with the government and the Annum Guard, and find out the identity of XP as much as Iris did. While the first book focused more on real historical events, adding in the internal Guard intrigue as the book progressed, this book was mostly focused on the later with historical events as backdrops. It was still fun to travel to different places a 3.5 stars. The sequel to The Eighth Guardian is fast paced and kept me quickly turning pages from start to finish. I wanted to figure out what was going on with the government and the Annum Guard, and find out the identity of XP as much as Iris did. While the first book focused more on real historical events, adding in the internal Guard intrigue as the book progressed, this book was mostly focused on the later with historical events as backdrops. It was still fun to travel to different places and times, though. I loved seeing how social customs, women's roles and security has changed so much. Iris continues to be stubborn and not good at listening to others, or following orders, and a few times I disagreed (strongly) with her choices. I'm glad there are people who call her out on that, even if she rarely listens. This series isn't as focused on character growth as it is action and deception, though I hope she'll find more growth by the end of the series. Despite that, Iris and I mostly got along though out this book. I would never do as well in the high pressure situations she encounters, and she barely has time to think about her personal life before she's rushing off into another high stress situation. My biggest problem with this story was the romance, which I'm going to talk about, because it's always an important part of a book for me. If romance doesn't skew as highly for you, then this might not weight as negatively as it did for me. Especially, if you are as invested in the other aspects of this story. Iris and Abe were dating when the first book began, which made sense for the way the story was set up. However, for most of both books, she and Abe have either been separated or not communicating well. That coupled with never seeing their initial connection when their relationship began, has eroded my enjoyment or understanding of their relationship. In this book, Iris and Abe's relationship stalls into an awkward holding patter where they keep coming to conflict then backing up and glossing over issues between them. I would think they were headed towards a breakup, but then in the next chapter Iris would strengthen her resolve to be with Abe and declare everything was okay. But I needed to see them working together and talking about their issues to believe in their relationship. Thankfully, it is not central to the plot, but Iris is thinking about it frequently. Honestly, they just didn't seem to be a healthy couple anymore. I'd almost like to see them back up and rebuild if they are going to stay together. I admire their loyalty to each other and for their sakes, I want them to work it out, but they have work to do! Also, this is a small thing, but though this series highlights some big events in past US history, there has been no mention of recent ones, such as 9/11. I'm surprised no one has mentioned what would happen if something like that was altered, or even that they tried to do that in the past. I mean, at least one of those flights actually left from Boston! Even if it was just a conversation, I think more complexity and relevance could be added to this story by asking some questions about that. Still, I like that Iris has begun to think through whether time travel and altering history are too dangerous as a whole to even mess with. Mit “Die Farbe der Zukunft” geht die spannende Zeitenspringer-Saga von Meredith McCardle endlich weiter – nachdem ich von “Die achte Wächterin” bereits begeistert war, freute ich mich nun ungemein auf die Fortsetzung. Seit den Ereignissen im letzten Band hat sich innerhalb der Annum Guard einiges getan: Iris’ Freund Abe hat sich nun den Zeitenspringern angeschlossen und die Annum Guard hat eine neue Vorgesetzte – nicht Red, welcher eigentlich genau dafür ausgebildet wurde, sondern Jane Bonner, ei Mit “Die Farbe der Zukunft” geht die spannende Zeitenspringer-Saga von Meredith McCardle endlich weiter – nachdem ich von “Die achte Wächterin” bereits begeistert war, freute ich mich nun ungemein auf die Fortsetzung. Seit den Ereignissen im letzten Band hat sich innerhalb der Annum Guard einiges getan: Iris’ Freund Abe hat sich nun den Zeitenspringern angeschlossen und die Annum Guard hat eine neue Vorgesetzte – nicht Red, welcher eigentlich genau dafür ausgebildet wurde, sondern Jane Bonner, eine vollkommen unbekannte Frau, welche sofort neue und strenge Regeln eingeführt hat. Diese hält vor allem Iris an einer sehr kurzen Leine und sorgt dafür, dass sie sich kaum der Suche nach dem mysteriösen XP oder Zeta, dem Vater von Indigo und Violet, widmen kann. Doch dann verschwindet eines Tages ein Zeitspringer völlig spurlos – und Iris muss sich entscheiden, wem ihre Treue gilt. Die Handlung in “Die achte Wächterin” war bereits voller Spannung, überraschender Wendungen und konnte mich mit der ereignisreichen Geschichte absolut überzeugen. Dem allen steht nun “Die Farbe der Zukunft” in nichts nach – tatsächlich hat mir der zweite Band sogar noch einen kleinen Tick besser gefallen, als es der erste schon getan hat. Wenn man die Ereignisse am Ende des vorherigen Romans nicht mehr so genau im Kopf hat, ist der Anfang hier sicherlich kurz verwirrend, da die Handlung sofort einsetzt und den Leser nicht erst noch aufklärt. Stattdessen wird sofort auf die Änderungen und die aktuelle Situation innerhalb der Annum Guard eingegangen. Doch sehr bald ist man wieder vollkommen gefangen von der Welt der Zeitenspringer und fühlt auch gleich mit der Protagonistin Iris – denn Jane Bonner ist wirklich alles andere als eine sympathische Vorgesetzte. Dafür herrscht mittlerweile ein tolles und freundschaftliches Verhältnis zwischen den Zeitenspringern selbst. Das war im ersten Buch noch ein wenig schwierig, da Iris neu war und sie selbst eher abgeneigt davon war, sich anzupassen oder gar Freunde zu finden. Nun hat sie in den anderen Mitglieder aber Freunde gefunden und fühlt sich zudem sichtlich wohl innerhalb der Garde, wenn man einmal von der Vorgesetzten und aktuellen Umständen absieht. Auf jeden Fall hat dies mein vorheriges Bild von Amanda alias Iris grundlegend verbessert und die freundschaftliche Atmosphäre wie der Zusammenhalt haben mir ungemein gut gefallen. Nachdem am Anfang noch nicht so viel Spannung aufkommt, da vieles erst noch geklärt werden muss und demnach eher still steht, sprüht der Rest der Handlung nur so vor Wendungen, Überraschungen, Sprüngen in der Zeit und das Buch aus der Hand zu legen, erscheint absolut unmöglich. Also wieder genau dasselbe “Dilemma” wie bereits in Band eins – doch genau solch ein Dilemma wünscht man sich von einem packenden Zeitreise-Roman, oder nicht? Wie bereits bekannt sein dürfte, liebe ich Zeitreise-Geschichten und die Zeitenspringer-Saga sind bisher definitiv die zwei besten Bücher, die ich in diesem Genre so lesen durfte. Normalerweise kann ich eine Handlung wirklich gut vorhersehen, manchmal wünschte ich, ich könnte es nicht so gut – deswegen bin ich umso glücklicher, wie sprachlos ich wegen so mancher Wendungen innerhalb der gesamten Handlung war. Blackout is the sequel to The Eighth Guardian, it is a fast paced novel that I enjoyed reading beginning to the end. Amanda Obermann is a member of a government organization called the Annum Guard. Later, she discovers a "blackout" squad is killing the guardians who get in the way of a corrupted force that is selling out both the Annum Guard's missions and guardian lives. Blackout felt more action and deception than character development. However, there was more progression in character developme Blackout is the sequel to The Eighth Guardian, it is a fast paced novel that I enjoyed reading beginning to the end. Amanda Obermann is a member of a government organization called the Annum Guard. Later, she discovers a "blackout" squad is killing the guardians who get in the way of a corrupted force that is selling out both the Annum Guard's missions and guardian lives. Blackout felt more action and deception than character development. However, there was more progression in character development than the previous novel. I hadn't read the previous novel in the series so I was at a disadvantage - I did read the first installment in the series after I had finished the second one. Iris(Amanda) is a bit hard-headed, she reminds me of myself, but sometimes I cannot understand her choices. Some of her choices are ridiculous, she defies logic and does what she pleases. Although, I do hope Iris develops more character as the series concludes. I did like the loyalty and bond between Iris and Abe, the romance was intriguing, although, it is not the central point in the plot which I appreciated. The book does end on a cliffhanger which depresses me. The twist was amazing though! I do like the direction it's going in. The ending was me excited for the third book, I'm anticipating the outcomes of some of the people. I enjoyed reading the historical details and travel aspects of the story. Blackout had the right mix of action, romance, adventure, and humor. The balance of these things was great, and the romance never overshadowed the actual plot. I would rate Blackout 3.5 stars. This book probably need to be read quite close to the 1st as there is no real recap from it and it just dives right on in there so it was slightly confusing for me, luckily I was reading as a buddy read so we were able to remind ourselves on things/people. The colours got quite confusing too at the beginning however by the time I had got a third into the book I was hooked again. I can't wait until the 3rd book to find out what the hell went on and how Iris is going to be able to fix this mess she This book probably need to be read quite close to the 1st as there is no real recap from it and it just dives right on in there so it was slightly confusing for me, luckily I was reading as a buddy read so we were able to remind ourselves on things/people. AHHHHH! Loved it! Full review to come. Meredith McCardle studierte Journalismus und Theater, bevor sie – in einem Anflug praktischen Denkens – erkannte, dass Journalismus eigentlich nicht ihr Ding und Theater nicht mehr als ein Hobby für sie war. Danach machte sie ihren rechtswissenschaftlichen Abschluss in Boston und arbeitete sieben Jahre lang tagsüber als Anwältin, während sie nachts ihrer Leidenschaft als Schriftstellerin nachging. Nach der Geburt ihrer ersten Tochter 2009 gab sie den Job auf und widmet sich nun ganz dem Schreiben. Meredith lebt mit ihrem Ehemann, ihren zwei Töchtern und einem hyperaktiven Terrier in South Florida. Vieles hat sich verändert bei Annum Guard. Der Verrat von Alpha und die Geschehnisse, die damit zusammenhängen, haben für erhöhte Sicherheitsmaßnahmen gesorgt. Auch die Leitung wurde anders belegt als ursprünglich geplant. Zeta ist seit geraumer Zeit verschwunden und Red, der eigentlich bereits zum zukünftigen Leiter ausgebildet wurde, wurde erstmal "degradiert". Und leider kann sie noch nicht mal mithilfe ihrer Kollegen und Freunde heimlich Nachforschungen anstellen, da ihr ausdrücklich untersagt wurde, den Namen XP auch nur auszusprechen. Schwer ins Straucheln kommt sie jedoch, als klar wird, dass XP die Finger bei Zetas Entführung im Spiel hatte!! Auch in Band 2 überzeugt der Charakter Iris wieder mit ihrer direkten, humorvollen Art. Wobei sie dieses Mal die meiste Zeit bedeutend nachdenklicher und ernster ist, was unter anderem dem Thema bipolare Störung ihrer Mutter und den Auswirkungen der Krankheit geschuldet ist. Selbstverständlich tragen jedoch auch die Taten ihres Vaters sowie die Gefahr, in der sie sich befinden, dazu bei. Auf mich wirkt sie reifer, was, wenn man den Verlauf der Geschichte einbezieht, sehr authentisch wirkt. Die Geschichte rund um die Verschwörung und XP ist in meinen Augen geschickt konstruiert, mit so manchen Irreführungen für den Leser, was natürlich noch mehr die Neugierde beim Leser weckt. Viel Spannung, aber auch die ein oder andere Emotion sowie Geheimnisse, Geheimnisse und Geheimnisse machen den Lesefluss perfekt! Sehr schön fand ich auch die kurzen Rückblicke in Band 1, die dem Leser das Verstehen der Zusammenhänge zusätzlich erleichtert haben. Alles in allem hat mir Band 2 sogar noch einen Ticken besser gefallen als der 1. (wobei dieser bereits klasse war), da mir einerseits die ernstere/nachdenklichere Stimmung und andererseits das enorme Verwirr- und Spannungslevel ein aus der Hand legen des Buches fast unmöglich gemacht haben!! Nur.... Der Cliffhanger, der war echt fies :D Aber schaut selbst! I wish I had known it was a cliffhanger, but I should have guessed. When do these series ever come in any less than three books. This time around things were a bit too chaotic for me. I liked the obnoxious Ms. Bonner as an antagonist and it was good to see more of Abe, I guess. The story, however, just spiraled out of control. Wenn man Mitglied einer geheimen Zeitreise-Organisation ist, hat man sicherlich kein ruhiges Leben. Doch seit Annum Guard eine neue Chefin hat, steht Amanda, Codename Iris, nonstop unter Stress. Zum Glück hat sie ihren Freund Abe an ihrer Seite! Doch als plötzlich mehrere Zeitenspringer spurlos verschwinden, macht Iris eine schreckliche Entdeckung: Eine Einheit namens »Blackout« versucht jeden auszuschalten, der sich XP in den Weg stellt, einer ominösen korrupten Macht innerhalb der eigenen Reih Wenn man Mitglied einer geheimen Zeitreise-Organisation ist, hat man sicherlich kein ruhiges Leben. Doch seit Annum Guard eine neue Chefin hat, steht Amanda, Codename Iris, nonstop unter Stress. Zum Glück hat sie ihren Freund Abe an ihrer Seite! Doch als plötzlich mehrere Zeitenspringer spurlos verschwinden, macht Iris eine schreckliche Entdeckung: Eine Einheit namens »Blackout« versucht jeden auszuschalten, der sich XP in den Weg stellt, einer ominösen korrupten Macht innerhalb der eigenen Reihen. Gemeinsam müssen Iris und Abe das dichte Netz aus Lügen und Geheimnissen um Annum Guard entwirren ohne aufzufliegen. Doch je mehr Iris erfährt, desto dringender muss sie sich fragen, wie viel sie riskieren will … Denn wer zu sehr in die Vergangenheit eingreift, gefährdet die Menschheit selbst. Achtung, es können Spoiler in Bezug auf die vorherigen Teile enthalten sein, da es sich um einen Folgeband handelt und sich diese Rezension teilweise auf Handlung und Informationen aus anderen Teil bezieht. Nachdem mir der erste Teil der Zeitenspringer-saga so gut gefallen hat, war ich auch sehr gespannt, was mich im in diesem zweiten Teil erwarten würde. Und vorab: ich wurde nicht enttäuscht. Der Leser ist sofort wieder mitten in der Story drin und man erlebt mit der Protagonistin eine veränderte Situation in Annum Guard. Denn Alpha ist tot und Jane Bonner an seiner Stelle und Amandas Freund Abe ist neues Mitglied in der Organisation. Wie auch schon im vorherigen Teil reist Amanda, Codename Iris, durch die Zeit um Missionen zu erfüllen. Sie stößt dabei zusätzlich auf Geheimnisse und versucht das große Rätsel rund um XP und Blackout zu lösen. Zitat : "Ich greife unter mein Shirt und ziehe die Annum-Uhr hervor. Soll ich projizieren ? Ich drücke auf den oberen Knopf - der die Uhr automatisch auf die Gegenwart stellt - und lausche, während die Zeiger über das Zifferblatt surren. Gerade will ich die Uhr zuklappen, da halte ich im letzten Moment inne." Amanda mochte ich als Protagonistin wieder sehr gerne. Sie ist sympathisch, ein starker Charakter, der einfallsreich und mutig ist, und hat zudem noch mit familiäre Probleme. Richtig gut gefallen hat mir die Beziehung zu ihrem Freund Abe. Diese Liebesgeschichte von den beiden wirkt realitisch und auch die Probleme sind gut dargestellt. Denn es läuft nicht immer alles rund, aber man merkt wirklich, wie sehr die beiden sich lieben. Das war echt toll gemacht. Abe mochte ich als Charakter dabei auch wieder gerne, er ist an ihrer Seite, aber hat auch seine eigene Meinung. Der Schreibstil von Meredith McCardle war wieder angenehm zu lesen und sehr flüssig. Sie hat die Geschichte spannend und fesselnd erzählt und ich wollte einfach die ganze Zeit weiter lesen. Zusätzlich hat sie auch die Missionen sehr bildlich mit geschichtlichen Hintergründen und Action dargestellt. Zitat : "Unsere Organisation ist ein bisschen verrückt. Wir haben so viel Macht. Die Macht, das Leben von Millionen von Menschen zu ändern. Zum Teufel, wir haben die Macht, das Leben von Millionen Mnschen zu zerstören, und das mit nur einem kleinen Fehltritt. " Interessant fand ich auch die drei Praktikanten Colton, Mike und Paige. Man wusste die meiste Zeit nicht, ob man ihnenn trauen kann und ob sie etwas verbergen. Insgesamt fokussiert sich die Geschichte auf die Thematik mit XP und Blackout. Wobei eine Verfolgungsjagd durch die Zeit ihren Lauf nimmt. Hierbei hat mir gut gefallen, dass die Wächter von Annum Guard und der Leser noch im Dunkeln tappen und nicht wissen, wer der Feind ist und warum er ihnen schaden will. Und zum Schluss noch ein paar kleine Worte zum Ende. Es hat mich fertig gemacht und ist ein absoluter und fieser Cliffhanger. Ich brauche jetzt sofort den nächsten Band. 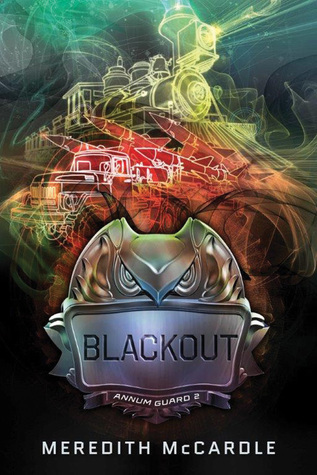 Blackout, the second book in the Annum Guard series, was a phenomenal sequel that is a must read for fans of the first book, The Eighth Guardian. It's no secret how much I adored The Eighth Guardian, and I was hoping with everything I had that this book wouldn't disappoint as some sequels do. Sometimes you build up the story so much in your mind that by the time the next book comes out, it is lackluster. Well, have no fear because Ms. McCardle has crafted an imaginative, amazing sequel that will Blackout, the second book in the Annum Guard series, was a phenomenal sequel that is a must read for fans of the first book, The Eighth Guardian. It's no secret how much I adored The Eighth Guardian, and I was hoping with everything I had that this book wouldn't disappoint as some sequels do. Sometimes you build up the story so much in your mind that by the time the next book comes out, it is lackluster. Well, have no fear because Ms. McCardle has crafted an imaginative, amazing sequel that will be very satisfying for fans. However, the ending...gah! I'm still reeling from it, and all I know is that I need the third book right now! Time travel is always a difficult thing to write about, and it's a genre that requires a delicate, skilled hand. Ms. McCardle does an amazing job at ensnaring the reader immediately, and if you forgot anything from the previous book, you'll remember it quickly. Time travel and the way it works with the Annum Guard is explained again in a way that doesn't feel repetitive from the first novel, and the writing is flawless. The pacing was fantastic, and you will fly through the pages wanting to know what will happen next. There is plenty of action, adventure, and yes...some romance. This was the one main thing I was afraid of since Abe (code name New Blue) is now part of the Annum Guard, however Ms. McCardle created a very nice balance. The romance between Amanda (code name Iris) and Abe never once overshadowed the story. But just fair warning, the romance might not be what fans are expecting. Another highlight were all of the settings. Even though we didn't get to experience the times that were traveled to very much (trust me there were much more important things going on, so it's no biggie), there is still so much detail and description that you feel as if you are truly there with Amanda on another exciting journey. The plot was brilliant and will definitely leave you guessing until the very end. Ms. McCardle has set up events that will make for an extremely interesting third book, and I honestly have no clue where the story is going to go from here. This second book does an excellent job at moving the story forward, and never once feels like "just the next book, just another adventure." Where this novel truly shines is the characters. The character development was utterly fantastic, and you can see how each character has changed since the events of the first novel. Obviously the dynamic of the team is forced to change, and with the introduction of new members to the Annum Guard, everyone is on edge with not knowing who to trust. Amanda is such a strong lead, and I adore her sarcastic, witty commentary. She had me cracking up so many times throughout the story. She is brave, strong, and will go to any length to find the truth, and those traits are clearly on display in this novel. I am extremely interested to see how Amanda handles the little problem (and by little I mean gigantic) that occurs at the end of this book. Overall, this was an outstanding addition to the Annum Guard series, with the perfect mix of action, adventure, and humor. If you haven't started this series yet, you are missing out! And if you're already a fan? Go pick this book up now! You won't be disappointed. Now, I'll just be the patiently waiting for the third book, which can't come soon enough! In dieser spannenden Fortsetzung um Amanda auch bekannt unter dem Codenamen Iris geht es wieder rund. Denn nachdem ja eine Intrige unbekannten Ausmaßes für Wirbel gesorgt hat und Amanda eine neue Chefin bekommt, steht sie mehr als je zuvor im Visier. Denn die Auswirkungen auf sie und die Menschheit sind enorm und die Zeitenspringer gefährdet, denn diese mysteriöse Geheimoperation namens Blackout versucht jeden auszuschalten der ihnen im Weg steht. Das Cover ist wie schon beim ersten sehr schön gestaltet und dieses Mal mit dem Rotton der ins Rosa geht sehr schön gehalten und der Titel macht Lust auf mehr, denn hier geht es um die Zukunft. hat einen flüssigen Schreibstil der mich gleich wieder mitten ins geschehene genommen hat und ich muss sagen sehr gut umgesetzt. Die Gefühlsstruktur der Protas oder die Idee hinter der Fortsetzung. Denn auch wenn Amanda nicht begeistert ist muss sie sich mit ihrer eigenen Vergangenheit auseinandersetzten und ich finde das macht sie Klasse und sie ist in diesem zweiten Teil gereifter wie im ersten und taff. Dann sind wir bei Annum Guard und dessen neuer Sicherheitschefin Jane Bonner. Die ist speziell darauf getrimmt wie es scheint Amanda alias Codename Iris vor zuführen wo sie nur kann und Amanda weiß dass sie im Visier steht. Denn nach den jüngsten Ereignissen von Alpha und dem aufdecken geheimer Machenschaften steht Annum Guard im Visier der Ermittler, denn es scheint einen Verräter zu geben. Auch das Amandas Vater eine Rolle dabei zu spielen scheint und ausgerechnet sie auf ihn angesetzt wird ist eigentlich unlogisch. Den als seine Tochter könnte man davon ausgehen, dass sie zu tief involviert ist. Aber Amanda weiß das sie zu Annum gehört und sie zu ihre Vater nicht wirklich einen Bezug mehr hat und genau da ist der Knackpunkt, denn genau das denkt Amanda und trotzdem ist sie von den Einsätzen geschlaucht. Die Sache wird nicht gerade besser wenn sie dann noch nebenbei in ihrer Zeit erfahren muss dass ihre Mutter die Therapie abbrechen will, die sie macht. Einzig und allein ihre Stütze Abe, ihr Freund kann Amanda so etwas wie ein Familien Gefühl geben, dessen ist sie nicht nur froh sondern auch glücklich. Aber noch ehe sie etwas Zweisamkeit Genießen kann, steht entweder ein neuer Auftrag von Jane an oder Infos über die Intrigen einer Geheimorganistation. Bei beidem versucht sie ihre Freunde nicht zu involvieren, da sie weiß, dass die Regierung damit ein riesen Problem hat auch wenn sie alle für sie arbeiten. Für mich eine tolle und vor allem spannende Fortsetzung. Man bekommt die Gefühle von Amanda sehr gut mit und ich kann sie voll und ganz verstehen. Dabei noch gleichzeitig mit den Problemen der Familie und der Vergangenheit auseinander zu setzten ist echt schwierig und gleichzeitig rauszufinden was hinter den Intrigen steckt und vor allem wer daran alles beteiligt ist. Absolut gut gelungen und empfehlenswert!!!! Bei Annum Guard hat sich einiges verändert, seit ans Licht gekommen ist, in welche Deals die vorherige Generation verstrickt war. Iris springt durch die Zeit, von der neuen Chefin Bonner dazu getrieben, ihren Vater zu beschatten. Bei einem Treffen mit der Vizepräsidentin erhascht sie einen Blick auf ein geheimes Dokument, ein Gesprächsprotokoll mit dem verschwundenen Agenten Zeta und eine Mission, die noch mehr Fragen aufwirft, bis sich Iris nicht mehr sicher sein kann, wem sie vertrauen kann und wer sein eigenes Spiel mit der Zeit spielt. Ich war absolut begeistert und fasziniert vom Auftakt der „Zeitenspringer-Saga“, so konnte ich es kaum erwarten, die Fortsetzung in den Händen zu halten. „Die Farbe der Zukunft“ beginnt mit einem Einsatz von Iris – eine Überwachung der Machenschaften ihres eigenen Vaters, der mitverantwortlich dafür zu sein scheint, dass sich im Laufe der Geschichte der Menschheit vieles zum Wohlwollen bestzahlender Kunden verändert hat. Die gesamte Organisation steht auf dem Prüfstand, strenge Regeln schränken das Springen der verbliebenen Agenten ein. Amanda/Iris wird jedoch noch mit einem weiteren Problem konfrontiert: Ihre Mutter verweigert die Behandlung mit Medikamenten und ihre nächste manische Phase steht bevor. Ein Umstand, der Amanda nicht in Ruhe lässt. Es geht so weit, dass sie sich durch zusätzliche Geheimniskrämerei von ihrem Freund Abe distanziert, der einzige Mensch, bei dem sie Halt findet. Doch es geht noch schlimmer: Amanda findet heraus, dass eine geheime Operation am Laufen ist: Blackout. Und welche Konsequenzen dies hat, können sich Amanda und ihr Team nur ausmalen, als nach Zeta auch Orange verschwindet. Allein durch die Geheimnisse und die Agentenhierarchie wurde ich erneut wunderbar unterhalten, überrascht und durch die Seiten gezogen. Meredith McCardle hat jedoch auch dafür gesorgt, dass es mir eiskalt den Rücken herunterlief, als sie die Originalversion des durch Annum Guard vereitelten Verlaufs der Geschichte aufgedeckt hat. Ich war absolut fasziniert von diesem ersten Einsatz und die eingeflochtenen Details, mehr noch als bei den anderen „Verbesserungen“ der Geschichte. So trieb mich die Autorin an der Seite der Ich-erzählenden Amanda durch die Seiten, baute immense Probleme auf und zahlreiche Gegner und falsche Fährten, die ich einfach so hinnehmen musste, weil sie absolut logisch in die Geschichte integriert waren. Ich jagte an Amandas Seite durch die Zeit und kam immer weiter dem tragischen Wendepunkt der Geschichte der Zeitenspringer entgegen, der mich gegen Ende des Buches schockiert zurückgelassen hat. Ich kann nur hoffen, dass Miss McCardle nicht mehr sehr lange für den dritten Teil braucht. Der zweite Band der „Zeitenspringer-Saga“ ist noch eine deutliche Steigerung zum ersten Band der Reihe. Die Jagd nach Hinweisen und Korruption durch die Zeit hielt mich zwischen den Seiten gefangen und die gelungenen falschen Fährten ließen mich nach Erkennen atemlos zurück. Eindeutige 5 Bücher für Meredith McCardles politisch angehauchtes rasantes Zeitreiseabenteuer „Die Farbe der Zukunft“. Meredith McCardles Serie „Die Zeitspringer-Saga“ ist eine dieser Serien, bei denen ich mich beim Erscheinen des ersten Bandes einfach nicht mehr daran erinnern kann, was in Band 1 passiert ist. Also war so ziemlich alles, was ich noch wusste, als ich „Die Farbe der Zukunft“ angefangen habe, dass es hier um eine Art Zeitreise-Regierungs-Agency-Thriller handelt. Der Wiedereinstieg in die Serie ist mir dabei nicht wirklich leicht gefallen, denn es hat eine ganze Weile gedauert, bis ich mich so richtig erinnern konnte, was in Band 1 passiert eigentlich passiert war und wieder wusste, wer wer ist und wie die Beziehungen zwischen den einzelnen Charakteren nochmal aussahen. Nach einer Weile hat mich der Roman dann aber doch noch voll und ganz in seinen Bann gezogen. Denn auch im zweiten Teil der Saga geht es rasant zu, die Wächter haben nach den Ereignissen des ersten Bands einen neuen Boss und werden das Gefühl nicht los, dass man versucht, sie von ernsthaften Ermittlungen abzuhalten. Statt durch die Zeit zu springen und herauszufinden, wer hinter dem mysteriösen Kürzel XP steht, sichten sie Steuerunterlagen und führen langweilige Observationen durch. Ich gebe zu, Iris/Amanda finde ich immer noch etwas nervig, weil sie sich hauptsächlich für sich selbst interessiert und dadurch die anderen Charaktere etwas zu kurz kommen in ihren Charakterisierungen. Auch dass die Geschichte hauptsächlich den Thrilleraspekt im 21. Jahrhundert verflogt und es nicht so viel historisches Feeling gibt, wie ich mir wünschen würde, finde ich nach wie vor schade. Allerdings ändert das nichts daran, dass die Geschichte wirklich spannend ist und mich bis hin zu diesem wirklich fieses Cliffhanger in ihren Bann gezogen hat. Nach dem fulminanten Auftakt einer neuen Zeitreise-Serie, blieb der zweite Band der Reihe nicht lange vor mit verschont. Und es wurde auch keine Zeit und Mühe gespart, sondern direkt dort weitergemacht, wo beim 1. Band aufgehört wurde. Doch eine neue Bedrohung bahnt sich an. "Blackout" heißt die unbekannte Mission von unbekannter Herkunft. Das einzige, was auffällt: Es verschwinden Mitglieder von Annum Guard. Fesselnd wie immer, wird untersucht, diskutiert, beobachtet und viel durch die Zeit gere Nach dem fulminanten Auftakt einer neuen Zeitreise-Serie, blieb der zweite Band der Reihe nicht lange vor mit verschont. Und es wurde auch keine Zeit und Mühe gespart, sondern direkt dort weitergemacht, wo beim 1. Band aufgehört wurde. Doch eine neue Bedrohung bahnt sich an. "Blackout" heißt die unbekannte Mission von unbekannter Herkunft. Das einzige, was auffällt: Es verschwinden Mitglieder von Annum Guard. Fesselnd wie immer, wird untersucht, diskutiert, beobachtet und viel durch die Zeit gereist. Mich faszinieren, wie auch beim 1. Band, die ganzen geschichtlichen Fakten. Besonders die eine um die Cuba Krise war ziemlich schockierend. Und dann sind da noch Amanda und Abe, eine Liebe, die fast keine Zukunft zu haben scheint. Doch die beiden machen wirklich das Beste draus, was mir gut gefallen hat. Nichtsdestotrotz gibt es Streitereien, an denen die beiden ziemlich zu knabbern haben. Rasend geht es auf das Ende zu. Amanda tut alles, um so viel wie möglich über Blackout herauszufinden und die verschwundenen Mitglieder zu retten. Doch es warten einige unangenehme Überraschungen auf sie, bei denen ich schon manchmal 2 mal hinschauen musste. Vor allem das Ende hat es mir angetan. Man kann unheimlich viel darüber sagen. Von "das hätte ich dir vorher sagen können" bis "jetzt hast du, was du wolltest" ist alles mit dabei. Bis vor Kurzem dachte ich noch, es gäbe keinen 3. Band, aber bei diesem Ende ist er unausweichlich und ich bin so unfassbar gespannt, wie Amanda mit der Situation umgehen wird. Leider hat es nicht ganz bis zur vollen Punktzahl gereicht. Das kleine i-Tüpfelchen hat gefehlt. Ein bisschen mehr Spannung mit passenden Wendungen hätten es vollkommen gemacht. 17 year old Amanda, (code name Iris) is part of a secret government organization of time travelers, called The Annum Guard. In this second book of the series, Amanda/Iris is dealing with changes in Annum Guard, as well as the danger that comes when fellow team members start to disappear on missions. The characters were pretty cool. They weren't especially memorable, but that could be because I missed out on the first book's character foundation. I thought the romance was sweet, although it seemed like any problems Abe and Amanda had were resolved very quickly and with no aftermath. I also really liked Yellow and Indigo! I hope there is more of them in the next book. I really love time traveling in books. With Doctor Who being my favorite show, this isn't surprising! I loved the time travel in Blackout. It was an interesting take on it, with it being part of the government. The clock they used reminded me Hermione's Time turner in Harry potter. Missing the first book wasn't too much of a problem. McCardle explained everything well, but not in a boring way. The whole time tracking thing thing could have been super confusing, but McCardle explained everything very clearly. I thought the action was well done and paced well. I thought the whole plot was really good! I liked the fashion mentioned, too. At one part she mentioned a 60's dress that Iris/Amanda bought for nine dollars and I almost cried. If I was a time traveler all I would do was go shopping, let's be honest. This is the second in the series, and readers should start with The Eighth Guardian or they will be lost. Blackout begins where the first book leaves off. The corruption in the Annum Guard has resulted in new security protocols and a new leader, but Amanda knows that the root of the evil hasn't been identified and makes it her mission to get to XP before he/she/it gets to her. The writer has to set up a whole n I received this ARC from the publisher via NetGalley in exchange for an honest review. With the way The Eighth Guardian ended, I couldn't wait to start Blackout. The best way to read a series is back to back. Right? Everything is fresh. However, I did not enjoy the sequel as much as I enjoyed the first book. I think it's the fact that I was expecting to be blown away. Until, 75% in is when things started to pick up for me. The ending was all worth it though! It was jaw-dropping. I did not expect such thing to happen. And I need the third book NOW. The Eighth Guardian ends with a big twist and Blackout picks right where it left off. We follow Amanda a.k.a. Iris in a new adventure, (for me, more like research quest). Unlike the first book, things are not going the way she hoped for. There is a new leader of the Annum Guard and Amanda has a weird feeling towards her. She digs into her identity and she digs herself to her grave! Sometimes things are meant to be kept as a secret. Well, if you gather enemies along the way, you know they will be coming after you. And indeed, they come after Amanda. There are many secrets Amanda is trying to uncover in Blackout and at times, I felt overwhelm. I had to put the book down at times and return to it later. Don't get me wrong, I wanted to find out, but sometimes it is better to take it one by one. As far as the action, I think it was lessen, which was my biggest issue. Reading the books back to back, I crossed from a badass Iris to a more composed Iris. However, with the way the story ended, I hope the third book will be one heck of a packed-action story. Auch der zweite Teil war sehr spannend und das bis zum Schluss und das Ende war einfach nur sprachlos. Ich will einfach nur noch Teil 3 lesen. Ich bin super gespannt und glaube, dass es genauso spannend weitergeht. Das ist der zweite Teil der Reihe. Und weiter geht es mit der ganzen Verschwörung, die ja ganz schön verworren ist. Amanda muss erstmal die einzelnen Daten zusammensammeln und dann verschwinden auch noch nach und nach Leute von Annum Guard. Und dann ist da noch die neue Leiterin Bonner, die einfach auch sehr verdächtigt wirkt. Wieder ist es von der ersten Seite an sehr spannend geschrieben. Dieses hält auch bis zum Ende an. Ich muss einfach immer weiterlesen, weil ich wissen möchte, wer ist XP und wie lösen sie die ganzen Probleme. Und dann das Ende. Alter! Ich MUSS den dritten Teil bald lesen. Amanda mag ich immer noch gerne. Sie ist intelligent und manchmal vergesse ich, dass sie ziemlich gut in solchen Agenten-Sachen ausgebildet worden ist. Abe, der Freund von Amanda ist nun auch mit dabei. Ich finde ihn als Freund ganz gut und er ist auch ein netter Kerl, aber vermissen würde ich ihn nicht. Im ersten Band fand ich, dass sich die beiden trotz ihres Alter schon sehr lieben. In diesem Band verbringen sie nun viel Zeit miteinander und streiten sich auch etwas und manchmal ist es auch etwas komisch zwischen den beiden. Blackout (Annum Guard #2) by Meredith McCardle starts with the fallout of Alpha’s betrayal of selling out the missions of the Annum Guard. The Annum Guard now is dealing with the interim leader Jane Bonner who is making things difficult for everyone. While Iris is snooping in papers left out by the Vice President she finds testimony from a closed door Senate meeting where a Senator asks Zeta about a covert operations team within the Annum Guard called “Operation Blackout”. Iris finds this information troubling. After several members go missing, Iris secretly works with Red to find out if their new leader, Jane Bonner is up to something and if there is any information on “Operation Blackout”. McCardle does an excellent job at summarizing the details from the first book and explained how time travel worked. The book is fast paced with plenty of action and adventure. Even though the second book focuses less on the historical aspects, the story does move forward and leaves you wanting more. This book was amazinggggg!!!! From the beginning I was hooked in and I couldn't put the book down. I even skipped lunch to read this book. The ending was very shocking and it was very sad but, well thats just that. This is the second book to the series and I do recommend reading the first one so that you can understand the second one. MEH, the plot got slightly better, Iris got slightly worse (she now thinks she can save the world). Intriguing, Excellent Read! I Loved It! This is a series that should be read relatively close together. I had forgotten so much and it took me a while to remember people and events. Meredith McCardle is a recovered lawyer who lives in South Florida with her husband and two young daughters. Like her main character in the Annum Guard series, she has a fondness for strong coffee, comfortable pants, and jumping to the wrong conclusions. Unlike her main character, she cannot travel through time. Sadly. She is the author of THE EIGHTH GUARDIAN and BLACKOUT.